© Justin Lane/Abir Sultan/EPA-EFE/REX/Shutterstock King Abdullah II of Jordan, left, and Israeli Prime Minister Benjamin Netanyahu. The deal was reached in November 1994 between Abdullah’s father, King Hussein and then-Israeli Prime Minister Yitzhak Rabin. The parts Jordan wants to revoke relate to two parcels of land Jordan leased to Israel for 25 years. The lease on the two territories — known as Baqoura and Ghumar in Arabic and Naharayim and Zofar in Hebrew — ends in one year. 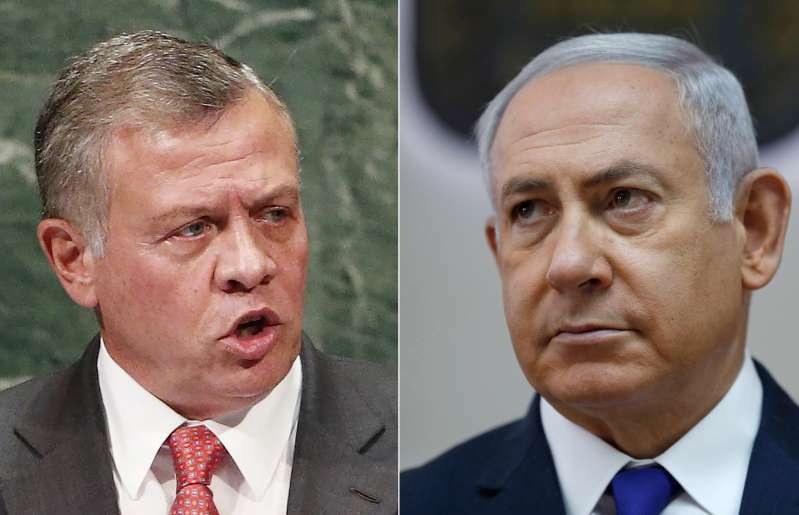 Jordan had until Thursday to make clear to Israel it would not renew the arrangement. “Baqoura and Ghumar are Jordanian lands and will remain Jordanian and we will exercise full sovereignty over our territory,” the king said, according to a royal court statement. The peace treaty with Israel is deeply unpopular in Jordan, where people claim that successive Israeli governments have failed to live up to water-sharing agreements. Israel’s ongoing occupation of Palestinian territories is also a source of anger among Jordanians. Speaking at an official memorial for Rabin, who was assassinated by an Israeli citizen in 1995 because of his push for peace, Netanyahu played down Abdullah’s announcement, saying he would try to negotiate an extension to the existing arrangement. In Jordan, however, the decision to downgrade its arrangement with Israel sparked celebrations. There has been a push in recent months to cancel the lease agreement and demand that Israel return the land. Both areas are used for agricultural purposes. Throughout the years, there have been sporadic periods of tension between the two countries. Three years after the agreement was signed, a Jordanian soldier killed seven Israeli schoolgirls visiting one of the territories now under discussion. Ahmed Daqamseh spent 20 years in prison but was released after Jordanian lawmakers petitioned on his behalf. More recently, relations have been strained over the status of the flash-point al-Aqsa Mosque compound, referred to by Jews as the Temple Mount, in Jerusalem and in the aftermath of a shooting at the Israeli Embassy in Amman in which two Jordanian citizens were killed.